Born in Istanbul, she started the piano at seven with Marie Çobangil. She continued her music studies at the Istanbul Municipal Conservatory (1957-1963) with Ozen Veziroglu, under the supervision of the famed tudor Ferdi Statzer. She graduated from the American College for Girls (Robert College) in 1966. Her literary and musical activities went side by side. She attended the Comparative History of Music seminars at the Michigan State University, U.S.A.(1969-1971). 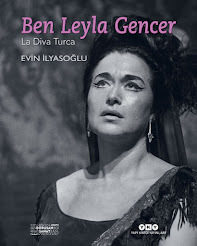 She produced and presented Classical Western Music programmes on Radio Istanbul for some twenty years starting in 1973. She was also the producer and presenter of a number of TV series. She won the first prize in Yeni Dergi contest of Criticism in 1968 with her essay on Nazım Hikmet’s poem, The Song of the Weeping Willow. She won the Turkish Language Society’s Radio and TV Language Prize (1978). Her book, Music Over Time with 10 CDs, was commisioned to her by the Yapı Kredi Bank, for its fifttieh anniversary and it made 10 editons selling more than 40.000 copies. She was the curator of the Istanbul Music Exhibiton within the Habitat II conference in 1997. Her reviews, essays and interviews have been published in numerous magazines (including Gramophone), newspapers and encyclopedias since 1980. Her novel Theodora’s Enemies is translated into Greek and released by the Livanis Publishers of Athens (2007). She is honored by the “Médallie D’honneur” of “Société d’Encouragement au Progrés” of Paris in 2013. She is decorated with the “Bene Merito Honorary Medal” of Polish Governmnet in 2014, Middle East Technical University’s Appreciation Award and Honor Award of Istanbul Music Festival (2017). Currently she is a lecturer at the Boğaziçi University and the organizer of the weekly classical music concerts of Albert Long Hall. She is a columnist in classical music of the Cumhuriyet Daily since 1991. She has written over 20 books where all of them about general history of music and modern Turkish music excepting one novel. She is the mother of Ekin İlyasoğlu Muslu. She was the wife of late Prof.Dr.Eyüp İlyasoğlu, who passed away in 2013.